The 3.1 Phillip Lim flagship store is located in Cheongdam-Dong. 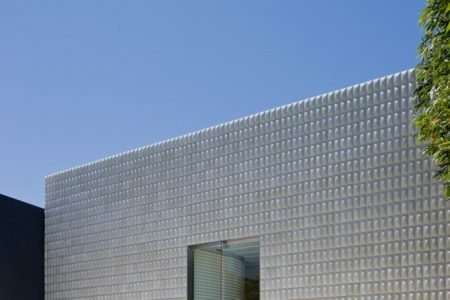 The design incorporates a 40-foot facade surfaced in a supple gradient of pillow-like concrete tiles. The flowing interior is a sequence of intimate spaces that frame the clothing in tactile materials. These material linings create a narrative of atmospheres for unexpected and curious encounters between the client and the clothing. Wallpaper inspired by ancient Korean ceramics as well as other material liners include a conical wall texture that erodes into a constellation of brass stars, leather herringbone tiles, and an oak floor that slowly transitions through a gradient of grey tones. The perimeter of the interior is lined in mirror, creating an inkblot effect by doubling the sequence of spaces.